Pressure Vessel Design Services | Design & Project Management - Meyer Tool & Mfg. 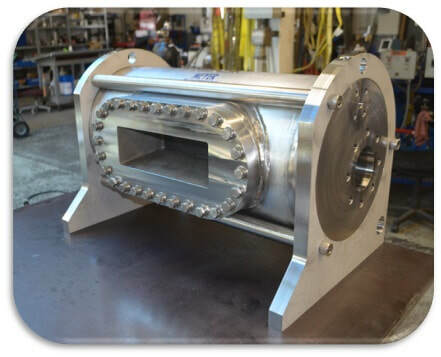 ​At Meyer Tool & Mfg., our custom pressure vessel design services are perfect for any engineer, scientist or procurement specialist who needs a custom pressure vessel. Our best customers are looking for solutions to reviewing their designs, and repairing any flaws or inefficiencies found in them during the review. Our pressure vessels are used in a variety of applications. Some examples include cryogenic apparatus, particle accelerators, natural gas process skids and many types of scientific research vessels. Let us design your next custom pressure vessel! We are custom pressure vessel manufacturing experts. We employ experienced engineering professionals who can take any design you give them — whether complex or simple, or even a basic drawing — and use it to create a set of custom fabrication prints and manufacturing plans. If you would prefer assistance in this area, we also provide pressure vessel engineering services. Our engineers will work with you to design and fabricate your pressure vessel around your unique specifications. We can create an ASME code-stamped pressure vessel for you, design it ASME standards without the stamp, or create entirely custom design. The ASME certification process merely provides additional documentation, testing, and design rigor for additional peace of mind and insurance regarding the performance of the vessel. We work with a variety of materials, including the two most common — stainless steel and aluminum. We are also familiar with working with more unusual materials such as high Nickel alloys like Hastelloy, Monel, and Inconel. We can work with any material you require in the production of your custom pressure vessel. The reason stainless steel and aluminum are so commonly used in these applications is because they are low in cost, easy to weld, they machine well, and they have high strength properties. High nickel alloys also have the advantage of being resistant to corrosion to a higher degree than other metals. If you aren't sure which type of metal will work best for you, we are happy to consult with you. The material that is right for your project depends on the type, scope and use of the pressure vessel. We are experts and will lead you in the right direction at all phases of your vessel’s design and construction. When you need highly customized pressure vessel fabrication, contact Meyer Tool. We are among the most highly rated in the business, and there is no project we can't tackle. Our engineers are experienced in custom designs of all kinds, using every imaginable type of material. We also create vessels for every industry and use. Don't wait to start your project. Begin now, with Meyer Tool — the best professionals in the business on your side. We are waiting and eager to serve you.